Every time I prepare to machine quilt I have a giggle to myself. How things have changed in the last 30 years or so. Allow me to explain my mirth. When I first discovered patchwork and quilting in 1976, it was the time the United States of America was celebrating its Bicentennial. 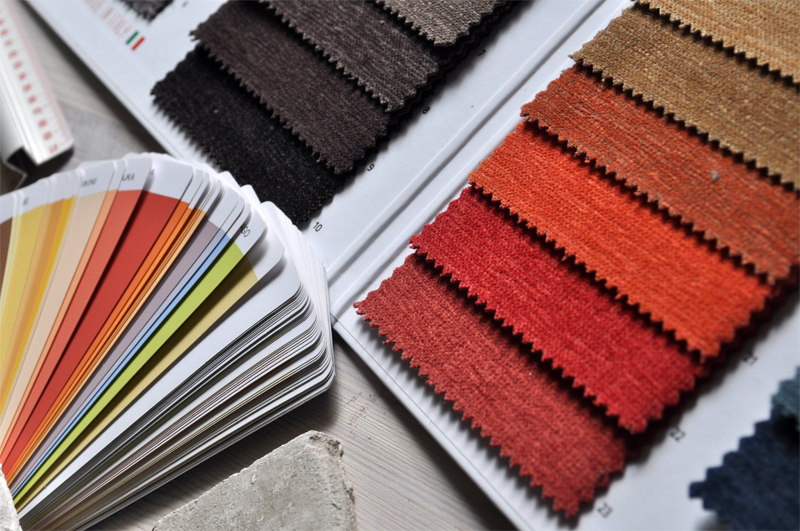 Of course, as you’re probably aware, the craft of patchwork and quilting found a renewal and refocus in the minds of crafters the world over. While America was busy examining it’s roots and foundations as a nation, the art and craft of patching and making do resurfaced, and how! All of a sudden the world was starting to experience the wonders of buying or obtaining scrap material, cutting it up and sewing it back together again in pretty patterns, without the onus of providing and making do. We could afford to be extravagant and make quilts because we wanted to. Modern quilting as we know it today had arrived. In that entire hullabaloo, there were still fragments of attitude left over from the past, and in particular the attitude of patchworkers towards quilting the three layers and how it was to be accomplished. In the past the method of quilting a quilt, was to mark the pattern on the finished quilt top, sandwich a batting between the finished top and the backing, stretch it over a quilting frame and hand quilt busily away usually during the winter months, ensuring that every quilting stitch was even, same length top and bottom, consistently 12 or 13 stitches to the inch!! 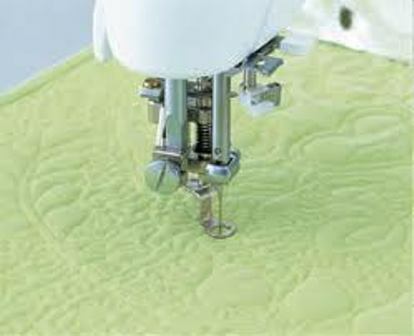 With the resurgence of the modern day patchworking and quilting, the sewing machine started to be used as the timely method for piecing blocks and rows together. Inventive quilters got busy designing all sorts of patterns and methods of piecing bits of fabrics together to make the quilt top. Hardly an eyelid was batted as we hunkered down in our battlements, quickie piecing, striping, and creating all sorts of wondrous quilt tops ready to be hand quilted. And this is where things became a little unstuck. We could make a quilt top in a weekend, but to quilt it would probably mean a commitment of at least months (if not years for some, like me). This idea didn’t sit well with the women of the 1970’s and early 1980’s. We were the burgeoning “super moms”, managing to juggle family, career, husbands, hobbies and all manner of miracles without working up a sweat. How could we devote so much time to an incredibly slow method of finishing the quilt off? Quilt tops seemed to procreate in our quilt cupboards. Some of us had so many quilt tops; we hid them from the embarrassment of having so many. 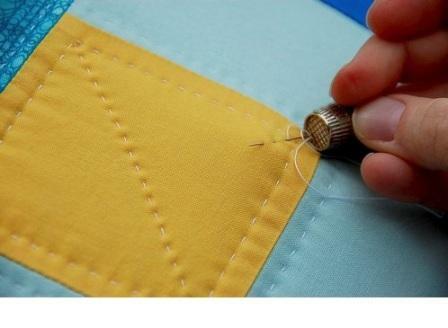 But we were learning to make the tops at such a fast pace, that quilting them to completion simply wasn’t keeping up. Enter the inspired quilter who had the courage to put her three layers together USING A SEWING MACHINE!! Unfortunately she was burnt at the stake by the traditional, conventional, conformist, unadventurous, old fashioned and old school hand quilters who deemed this type of finishing to be a profanity, a sacrilegious, improper and irreverent solution to the “how will I quilt it question”. So the idea of using a sewing machine to quilt was rejected by most quilters……. for a while. Then finally, a number of quilters started to finish their quilts by machine quilting, and soon the hand quilters had to accept defeat, but still managed to influence the attitude towards machine quilting for about the following 5 years or so. At the beginning of 1980’s quilters would only machine quilt their quilts “in the ditch” in the hope of hiding their “dirty little secret” from the hand quilters. These quilts were valued less that the traditional hand quilted quilts, even if the patterns were fantastic and beautifully put together. Most quilts that were machine quilted were only quilted in the seam line, called stitching in the ditch. There was very little decorative quilting and in fact if you wanted to decoratively quilt, you would often machine in the ditch, then hand quilt the decorative quilting pattern. The general attitude to machine quilting was “Ok, I’ve machine quilted it because I want to use it before the turn of the century, but I have hidden it as best I can”. We even turned to monofilament threads in the hope we could trick even the sharpest trained eye. But alas, it didn’t work, you could still see the monofilament shine when the light was in a certain position, and of course, you could also see the melted monofilament when you ironed it by accident. So during the mid 1980’s, at last, some very inventive and creative quilters decided they’d had enough of this “hide and seek” attitude to quilting and at last started to show their quilting by machining patterns onto the quilt blocks proper, right there in the middle of quilt blocks, right out in the open. They started to create the continuous quilting method we use today and in no time the attitude to machine quilting evolved into an art in its own right. Something to show, and be very proud of. Machine quilters started to exploit the patterns of the blocks themselves, and the fabrics that were being used. Machine quilters began to invent ways to make these quilts sing with machine quilting, remaining mute with out it. And at last in our modern times, machine quilting has been accepted as an equal skill in the art of creating a wonderful masterpiece or a quilt for your son’s bed. I really believe we are living in exciting times as quilters. We remember the past, and still have a huge amount of respect for a beautifully accomplished hand pieced and hand quilted work of art. We just want to live long enough to finish all the quilts that are currently stored in our heads, and machine quilting as allowed us to do just that!